The Leiber River runs through the north of this region and an abandoned mill, the Hankenshank, still stands there. Local taverns still share it's tale about an powerful curse placed upon it by an wood elf nearly 50 years ago. As the story goes, Gilliad Hankenshank successfully negotiated a lumber treaty with the Limb Strider clan, wood elves who had lived in the forests for centuries. Gilliad had adventured with the clan's chieftain, Arak Silverglen, and only took trees that the Limb Striders allowed. However, when Gilliad suddenly passed away, his daughter Marith, began to break the agreement with the wood elves leading to several months of conflict with them. Eventually, she hired mercenaries to slaughter them and upon his death, Arak uttered a death curse on his friend's daughter. Within a year, Marith had died of illness and the Hankenshank shut down beacause woodcutters and mill workers refused to work due to Marith's spirit haunting the mill as a specter. A family of ogres has spend several decades dwelling in the abandoned Limb Strider structures. There are seven ogres living there and hunting the forest and small hills of the whole region. They are being led by a half-ogre named Gedda, a warlock who has made a pact with Zargon the Returner and she uses her magic to manipulate the other members of her twisted family. Gedda has taught her family new ways to hunt and systematically cover their territory. 70% of the time an ogre notices intruders within their territory, it will gather wait to attack and ambush their enemies in group of 1d4+1 and there is a 60% chance Gedda is with them. 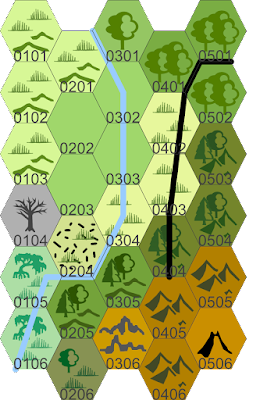 Terrain is thick forests and sloping hills.